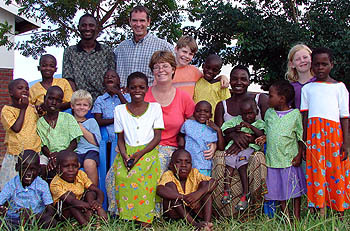 The Morrisons' moved to Bangula, Malawi in September 2003, leaving their home in Oakville, Ontario. God has been growing their interest and passion for mission work in the developing world for a few years now. Joanna grew up in a missions family, and has longed to live in Africa. During a visit to Mozambique in 2002, God enlarged David's heart for the poor and for the abandoned children of these lands. The Morrisons' desire is to serve the poor, to train and develop Malawi pastors, and to provide homes for the growing number of orphaned and abandoned children. As part of the work they also hope to develop a base to house short-term mission groups from the west. While the work in Bangula is still very young, there are over 500 churches in the area, with as many pastors waiting to be trained. Stage one of the Bible school building is now complete. Classes began in September 2003, with sixty pastors attending the first-term class. David is directing the school, leading a team of three westerners and three nationals who are teaching and ministering to the pastors. The pastors live at the school for three months and return for a second and third semester during the second and third years. The school will have to expand in terms of facilities and staff over the next few years to accommodate the addition of a new class each semester. As an integral part of the training, the Morrisons will be facilitating church-based care for orphans. Upon graduation, the hope and expectation is that Iris pastors will personally be responsible for the care of ten orphans. David and Joanna have three children: Patrick, Daniel, and Kalina. Initially, Joanna will be homeschooling their children and building relationships with the mothers of the childrens' new friends. The local dialect in Bangula is Chichewa and language study will be an ongoing priority.